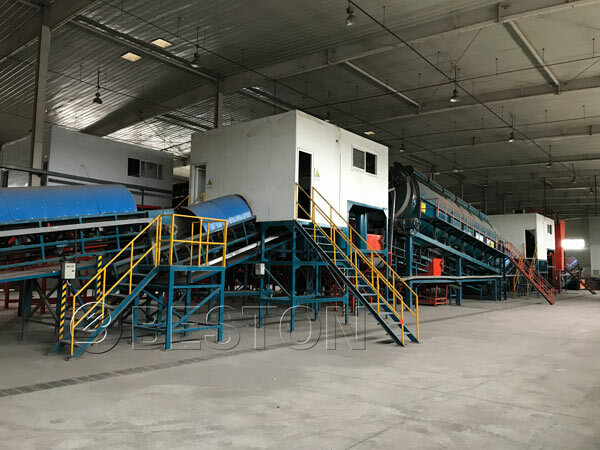 Beston waste plastic sorting machine is mainly used for separating plastic and other materials from solid waste. And the sorting rate of plastic film can reach more than 90%. Generally speaking, the high value-added quality plastic will be sent to plastic pellet plant. Other low-grade non-pellet plastic will be sent to pyrolysis plant, which can be converted into fuel oil. Beston waste sorting systems mainly include the following parts: they are Plate feeder, Bag breaker, Sealed belt conveyor, Magnetic separator, Rotating screening machine, Comprehensive winnowing machine, Manual sorting platform, Gravity separator, Eddy current separator, plastic color sorting machine, Hydraulic packing machine, Hydraulic metal presser, Spraying deodorization tower, Deodorization tower. The forklift transports the rubbish into the rubbish bin, and the hopper bottom plate conveyor will take away these rubbishes; The garbage will be balanced by ejecting device, and then be sent material layer dial evenly after the first belt conveyor;Workers will pick out bulky waste when the garbage goes through the manual sorting platform, at the same time the black metal will be picked out by strong magnetic magnetic separation; These rubbish will be separated again by broken drum screen, and will be sorted into two kinds of rubbishes, the diameter greater than 90 mm(plug hole size according to the reality of garbage) on the screen and less than 90 mm undersized material; Then the undersize material as raw materials for the system of fat output. The diameter more than 90 mm sieve material will be through the sieve material transport conveyor into other devices (or packed storage). (1) Fully automatic operation, to avoid manual operate mistake. (2) All the processing procedure are under monitoring, ensure the producing going smoothly. (3)Special odor control system, ensure the workshop has a good environment and protect the workers’health. (4) Sealed producing process, reduce the pollution of the waste.